San Francisco-based Prosper launched today (Prosper was called Circleone during its stealth stage). Like London-based (and Benchmark funded) Zopa, Prosper is a marketplace for borrowers and lenders. Individual borrowers say how much they need to borrow (up to $25,000) and the maximum interest rate they will pay. Interested lenders say how much they want to lend, and at what rate. 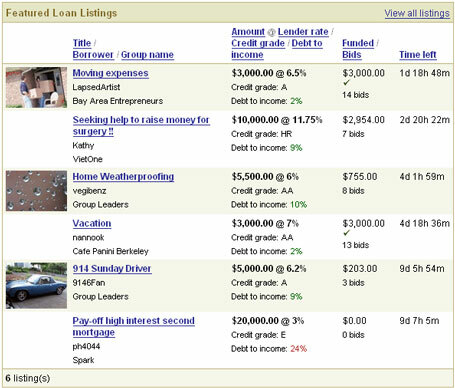 Prosper takes the lowest price lenders and groups them into a loan. It generally takes 2-4 days to close a loan, according to Prosper. However, a borrower can request an expedited loan, which will take the first lenders who meet the minimum requirements for amount and interest rate. Prosper charges a number of fees, including a 1% closing fee to the borrower and a 0.5% annual loan maintenance fee for lenders. Benchmark has funded both Zopa and Prosper. Other Prosper investors include Accel, Fidelity and Omidyar.